The Talley family has a long history in Berrien County, GA. Reverend Nathan Talley came, from Greene County, GA to Berrien County with his wife, Martha Travis some time in the 1850s. The Methodist minister resided in the vicinity of Ray’s Mill. He was a neighbor of Keziah Knight, daughter of William Anderson Knight, and her husband Allen Jones. Also residing with the Talleys was Dr. John W. Turner. In 1861, Reverend Talley was serving as minister of the Methodist Episcopal Church in Milltown (now Lakeland), GA. He gave the invocation and led hymns for the Grand Military Rally for the Berrien Minute Men at Milltown, GA on May 17, 1861. Two of Reverend Talley’s own sons were among the medical men of Berrien County. Dr. Hamilton M. Talley practiced medicine in Nashville and Valdosta, and also called on residents of Ray’s Mill (now Ray City), GA. In the Civil War, Dr. H.M. Talley served as Captain of Company E, 54th Georgia Regiment, one of the infantry units raised in Berrien County. Dr. James W. Talley, had a medical practice in Milltown (now Lakeland), GA.
James W. Talley, M.D., was born February 22, 1826 in Henry county, GA, not far from Atlanta, and is of English ancestry. His grandfather, with two brothers, came to this country, and the former, Caleb Talley, after serving during the revolutionary war, settled in Virginia. He was the father of seven sons, five of whom were Methodist ministers. One of these, Rev. Nathan Talley, of Green County, GA, was the father of James W. Talley. The later received a good academic education, and in 1850 began the study of medicine under Dr. William Blalock, of Fayetteville, GA. In 1851, he entered the Medical College of Georgia, at Augusta, but took his degree from Savannah Medical College. Dr. Talley’s family consists of two sons and four daughters. His eldest son, Junius V., born May 8, 1872, graduated from the Louisville Medical college in June 1894; William T., born August 30, 1875, at home, attending school. The eldest daughter, born in 1854, is the wife of Huffman Harroll, a merchant of Valdosta; Mary I., born in 1864, married J.H. Bostwick [Bostic], a manufacturer of naval stores in Berrien county [and a trustee of Oaklawn Academy]; Effie C., born November 5, 1870; Lelia H., born September 6, 1873, is the wife of J.J. Knight, a merchant of Milltown. Dr. J. W. Talley’s son, Dr. Junius V. “June” Talley, after graduating from Louisville Medical College returned to Milltown (now Lakeland), GA where he also took up practice. In October 1894, Dr. J.W. Talley was elected to the executive committee of the short lived Berrien County Prohibition Association. Dr. James W. Talley died November 25, 1895. An obituary was published in the Tifton Gazette. Death has again visited our community, and claimed as its victim Dr. J. W. Talley. Dr. Talley came to this country in the year 1856, and has been a practicing physician here ever since. He was an exemplary citizen and a Christian gentleman, having joined the Methodist church in early boyhood, and leaves a large circle of relatives, friends and acquaintances, who were present today at his burial. The funeral services were conducted by Rev. E. L. Padrick and Rev. Wm. Talley, who read a short history of the deceased’s life. The bereaved wife and children have the deepest sympathy of the entire community. BUTTERFLY. 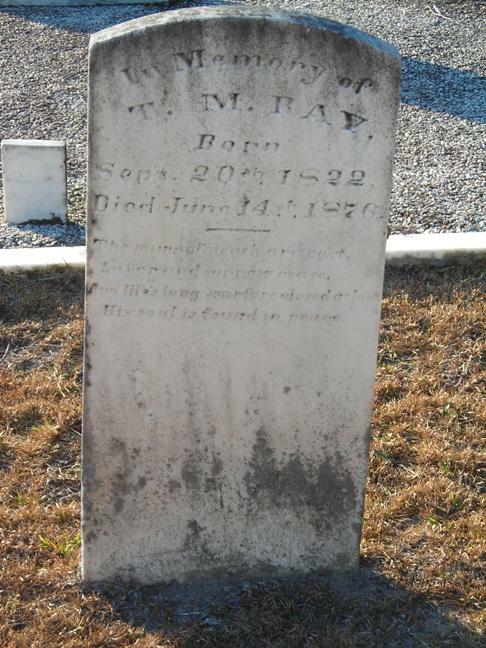 Thomas Marcus Ray, founder of Ray’s Mill, came to the area in 1855 prior to the formation of Berrien County, GA.
Gravemarker of Thomas Marcus Ray, founder of Rays Mill, GA. The pains of death are past. and Life’s long warfare closed at last. His soul is found in peace. Thomas Marcus Ray was born on September 20, 1822, in the area of Georgia that would later be known as Griffin, Monroe County, GA. His parents were Thomas and Mary Ray. Little is known of his early life. The 1850 census shows at age 28 Thomas M. Ray was working as a mechanic in Twiggs County, GA. He married Mary Jane Albritton on March 3, 1852 in Houston County, GA. She was the daughter of Allen and Rebecca Albritton, and the sister of Matthew H. Albritton. 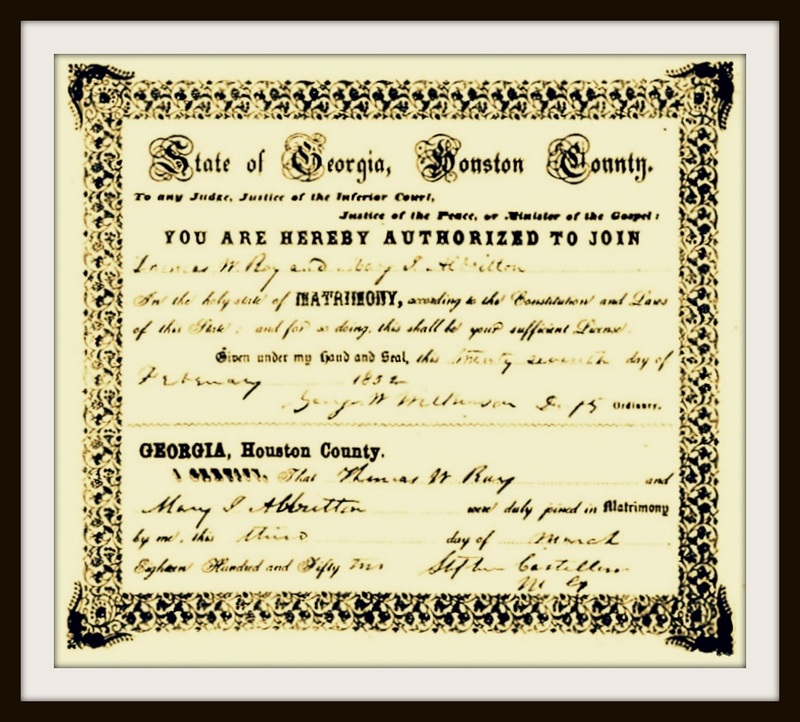 Marriage Certificate of Thomas Marcus Ray and Mary Jane Albritton, March 3, 1852, Houston County, GA. The newlyweds moved to the area of Lowndes County that was later cut into present day Berrien County, GA. A little more than a year later, Mary Jane gave birth to a son, John William Allen Ray, on May 10, 1853. Sadly, just six days later Mary Jane died and Thomas, a 31 year old widower, was left to raise the infant on his own. 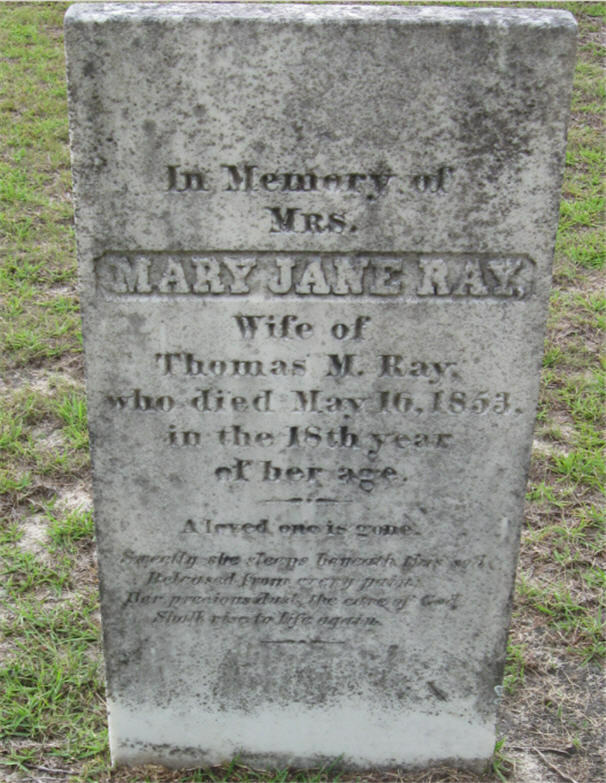 Thomas buried Mary Jane in the cemetery at Union Primitive Baptist Church, which was the only church in the area. Union Church, now known as Burnt Church, is located on the Alapaha River in present day Lakeland, Lanier County, Georgia. Gravemarker of Mary Jane Albritton Ray, Union Church Cemetery, Lanier County, GA. In 1853 this section of the state was only sparsely populated, and most of the settlers in the area gathered at least once a month at Union Church for services. Thomas Ray was among those who attended. It may be there that he met the 17 year old Mary Adelaide Knight. She was the daughter of Levi J. Knight, a renowned Indian fighter and prominent planter in the area. She was also the granddaughter of the Reverend William A. Knight, one of the founders of the Union Church and the first state senator elected to represent Lowndes County. The following year, on August 22, 1854 Thomas M. Ray and Mary Adelaide Knight were married. Thomas and Mary established their homestead on lot #516 in the 10th district of Lowndes County near Grand Bay, on land that Thomas purchased from his wife’s grandfather, William A. Knight, in 1855. This land was soon to be cut into Berrien County in 1856 (and later into Lanier county). Thomas’ father-in-law, Levi J. Knight, was instrumental in laying out the boundaries of the newly formed Berrien county. On this land, the newlywed couple settled down to raise a family. In 1855, a daughter was born, whom they named Mary Susan Ray. In 1858 a son was born to the couple, Thomas M. Ray, Jr. and in the spring of 1860 Mary A. delivered another son, Charles F. Ray. The Census of 1860 shows that Thomas M. Ray was clearly a wealthy man in his day. On the census form his occupation is listed as merchant. At that time owned $2000 in real estate, and held $10,400 in personal estate. If he had a comparable net worth in 2007, he would certainly have been a multimillionaire. The 1860 Census indicates that, in addition to the Ray children, two other youngsters were living with the Ray’s. John T. Ray, Thomas Ray’s 15 year old nephew, lived with the family and attended school along with his cousins. John T. Ray would be killed in a train wreck in 1888 (see Railroad Horror! 1888 Train wreck kills John T. Ray and 30-odd others.) A young girl nine-year-old Efare Hayes (aka Ellifare Hayes), who was also living in the Ray household did not attend school. Later census forms show that she was a domestic servant for the Rays. The census records show Ray’s neighbors were John Gaskins and Louie M. Young. The 1860 U.S. Federal Census – Slave Schedules show in that year Thomas M. Ray also was a slave owner, with one black female slave and one slave house enumerated. 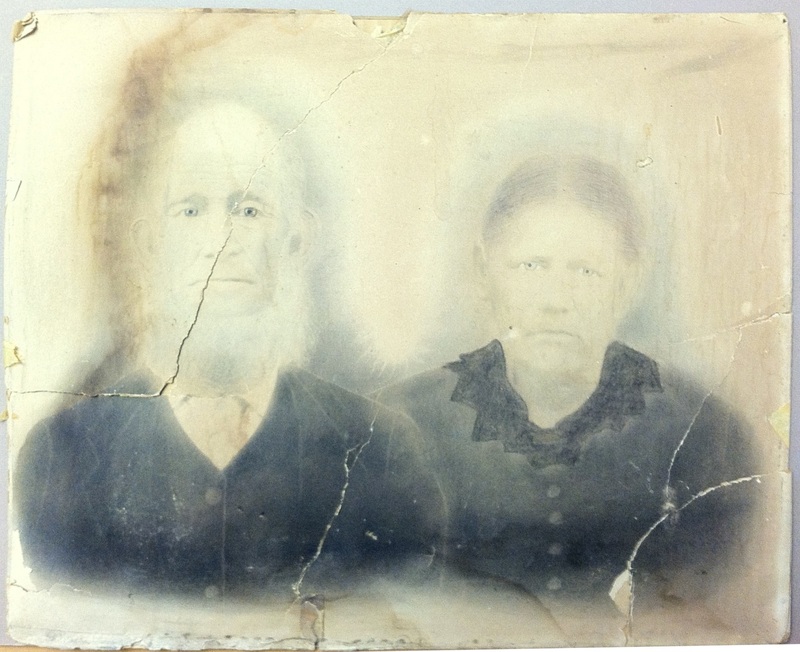 Together, Thomas M. Ray and Mary Adelaide Knight had nine more children between 1855 and 1876, their last son being born in the year of Thomas’ death. 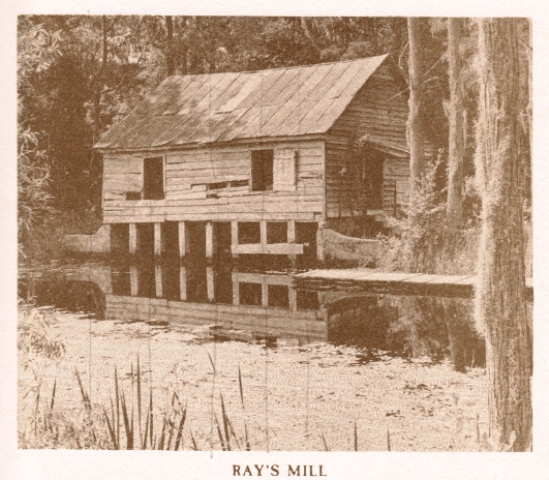 In the early 1860’s Thomas Ray partnered with his father-in law Levi J. Knight to build a grist mill and mill pond (now known as Ray’s Millpond) on Beaverdam Creek on land owned by L. J. Knight. Mr. Knight would provide the land for the project, Mr. Ray would be mechanic and operator. With the assistance of slave labor, the Ray family began the work to construct the earthen dam that would create an impoundment on Beaverdam Creek. In her later years, Mary Susan Ray, daughter of Thomas and Mary A. Ray, recalled that she helped build the dam when she was young child. ” Each day the family would load all equipment into the wagon, go over and work all day on the dam.” In the age before power equipment the construction of the earthen dam that created the millpond was a massive undertaking. The dam is 1200 feet long with an average height of 12 feet, 12 feet wide at the top and 20 feet wide at the base. It took approximately 10,800 tons of earth, dug and moved by human muscle to construct the dam. It was while the dam was under construction that the initial hostilities of the Civil War broke out. On April 12, 1861 at 4:30 a.m. Confederate forces opened fire on Fort Sumter in Charleston, South Carolina. During the Civil War, Thomas Ray’s father-in-law, Levi J. Knight, and his future son-in-law Henry H. Knight both served in the 29th Georgia Volunteer Infantry. Thomas himself, was a major in the 138th Battalion, 6th Military District, Lowndes, County, GA. There is no record that this unit saw active duty during the war. Thomas M. Ray was apparently at his home near Grand Bay in the fall of 1861, for Mary delivered another daughter the following spring: Sarah Jane “Sallie” Ray was born May 23, 1862. According to a history of the Wiregrass area published by the Coast Plain Area Planning & Development Commission, Thomas M. Ray began operation of the grist mill, known as “Knight and Ray’s Mill” on November 7, 1863. Thomas Ray was still at home in the late summer to early fall of 1864, for in the spring of 1865 James David Ray was born on April 30, 1865, just days after the surrender of General Robert E. Lee at Appomattox. After the war, in 1866 Thomas Ray bought land from his partner and father-in-law, Levi J. Knight, where the Rays constructed a new home and moved their family. This land was 225 acres of lot #424 in the 10th district of Berrien County, on the west side of Beaver Dam Creek right next to the grist mill. Nearby were the homes of his mother- and father-in-law, Levi J. and Ann Knight, and his wife’s cousin Henry H. Knight. To the west of the Ray farm was the property of William Gaskins. Even after the Civil War ended slavery, cotton was the major agricultural concern in the south. In 1869, Thomas Ray and William Roberts set up a mill for ginning and carding cotton on Beaverdam Creek downstream from Ray’s Mill. From that point on the creek came to be known as both Beaverdam Creek and Card Creek. The cotton mill was situated on land purchased from the estate of William Washington Knight, deceased brother-in-law of T. M. Ray. (W.W. Knight died of disease during the Civil War; see The Poetry of Mary Elizabeth Carroll.) The mill site included 30 acres on lot #452 and the right to impound water on lot #451, just east of #452. “This operation was apparently taking advantage of a small pond and dam already put in place by John Knight whose property it adjoined…” The dam site was on Beaverdam Creek about 20 yards just east of present day Pauline Street in Ray City, GA.. In early August of 1870 when the census was enumerated for the 1144th Georgia Militia District, the household of Thomas M. and Mary Ray included their children William A., Mary S., Thomas M. Jr., Charles F., Sarah J., James D., and one year old Elizabeth Texas Ray. Also living with the family was Thomas Ray’s mother, Mary Ray, 78 years of age. Ellifare Hayes, the family maid was now a young woman of 19. Eight year old Ellin Jones was an African-American domestic servant also living in the Ray household. In 1870 Thomas M. Ray’s personal estate was valued at $5000 and his real estate at $2714. His neighbors included Robert A. Elliott and Annis Lastinger Elliott, and their children. Robert A. Elliott was a mechanic and a hand at the wool mill. Another neighbor was Isaac J. Edmonsen. General Levi J. Knight, long time friend, partner and father-in-law of Thomas Ray, died on February 23, 1870 in the community where he lived (nka Ray City) in Berrien County, Georgia. Afterwards, Thomas Ray bought out L. J. Knight’s interests in the grist mill and the land, including water-flow rights, from the General’s estate. Over time the mill became the focal point of a community which came to be known as Ray’s Mill, GA.
Willis Allen Ray was born in 1871, and Robert Jackson Ray in 1873. The 1874 tax digest show that Thomas M. Ray was an employer; working for him was Andrew Wilkins, a Freedman and farmhand who lived near Rays Mill. In 1874 when Mercer Association missionary Reverend J. D. Evans came to Ray’s Mill, Thomas M. Ray was deeply moved by the baptist’s message. Thomas M. Ray must have attended the church meetings in the old log school house and the big revivals that were held in May and July, for he became instrumental in the formation of a Baptist Church at Ray’s Mill (see Men at Beaver Dam Baptist Church.) On September 20, 1874 a small group of followers met with Reverend J. D. Evans at the home of Thomas and Mary Ray to organize the church. Thomas M. Ray. and David J. McGee were elected to represent the new church to the Mercer Baptist Association and were sent as messengers to the Valdosta Church. The Reverend J. D. Evans wrote a petitionary letter which they carried to the association. In November 1874 Thomas M. Ray was appointed to a church building committee along with James M. Baskin and D. J. McGee. He served on the committed that selected and procured the site for the construction of the church building. He continued to serve on the building committee until his death. In 1876, Joseph Henry Ray was born. Maj. T.M. Ray, a prominent citizen of Berrien County, died last week, after a long spell of illness. Resolved, 1st. That, in his death Masonry has lost a worthy brother, the neighborhood an upright and honest citizen; his family a kind husband, and indulgent father and a good provider. Resolved, 2nd. That while we mourn his loss and miss his association, we bow with meek submission to the will of Him who doeth all things well. Resolved, 3rd. That we cherish his memory and recommend to the emulation of the Craft Iris virtues and the uprightness and integrity of his character. Resolved, 4th. That we extend to the family an relatives of our deceased brother our heartfelt sympathies, praying upon them the guidance and protection of our common Heavenly Father. Resolved, 5th. That a blank page in our minute book be inscribed to his memory, and that a copy of this preamble and resolution be furnished the family of brother Ray, and a copy furnished the Berrien County News, for publication and the Valdosta Times requested to copy. By order of Butler Lodge No. 211 F. &A.M.
Ogden H. Carroll, T.O. Norwood, Jesse Carroll, Com. Railroad Horror! 1888 Train wreck kills John T. Ray and 30-odd others. Hardeman Sirmans was born October 25, 1821 in Appling County, Georgia, the son of Jonathan Sirmans and Martha “Patsy” Rouse. During the Indian War in 1838-39 Hardeman Sirmans and his father served as privates under Captain Levi J. Knight (later General Knight) in the Lowndes County militia. They both appear on the 1838 Muster Roll of Captain Knight’s Independent Company. In 1847 Hardeman married Elizabeth Knight, daughter of General Levi J. Knight and Ann D. Herrin. She was born in 1830. Before the Civil War, Hardeman Sirmans was a slave owner. One of his slaves was Richard McGowan. For a time after the war, Richard McGowan continued to live on the Sirmans farm, working as a farm laborer.